New York: The Philadelphia Museum of Art recently inaugurated a new series of artist talks with a presentation by the very established and respected contemporary Indian artist Atul Dodiya. Held on February 13, the talk titled Somersault in Muddy Waters – A Creative Journey took the audience on a trip with the artist, along the many roads his work has traversed. This was an interesting journey to undertake with this artist in particular because of the diversity of his chosen mediums and the complexity of his oeuvre’s visual language. As Darielle Mason (The Stella Kramrisch Curator of Indian and Himalayan Art at the Philadelphia Museum of Art) said in introducing Dodiya, “…his works and he so clearly bridge times, cultures and concepts…”. The artist began by speaking of the diverse western and Indian artistic traditions that have consciously been a part of his art. Starting with his first solo show from 1989, his talk went through the stages of his artistic processes and mediums. Self-identifying as essentially a painter, he spoke of the varied mediums he has worked in including his world famous shutters, cabinets, and watercolors. A significant component of his talk focused on the importance of Mahatma Gandhi in his life and his pervasive presence in his work, which had culminated in the artist’s 1999 series on the Mahatma titled An Artist of Non-Violence. We were also fortunately able to see a series of delicate watercolors by the artist that have not been shown in public – these are ornithological studies of birds that he said were done for leisure, for relaxation. The Museum plans to post the talk online and I will update this post with a link when that is available. In the meantime, if you are in Philadelphia, please visit the museum. 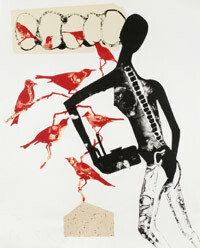 The work above, Sabari with her Birds, is part of the museum’s collection and is on exhibit for the next six months.